"This is kid-approved and great to serve chilled on a hot summer's day. Great addition to any meal or just alone." 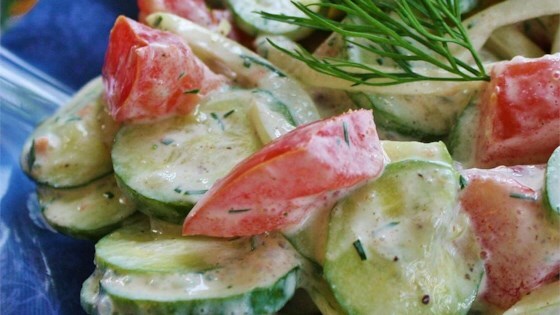 Combine tomatoes and cucumbers in a bowl. Add sour cream, balsamic vinaigrette, lemon juice, dill, and garlic salt; stir. Season with salt and ground pepper. This was great! The balsamic dressing gave it a nice zing without pucker that you can get from vinegar. I added a dash of sugar for sweetness.